Big Brothers Big Sisters Play Tennis! A fall Kick-Off Carnival of the Your Turn for Tennis program was held at Paseo Racquet Center on Saturday, September 29 from 11:00 a.m. – 1:00 p.m. 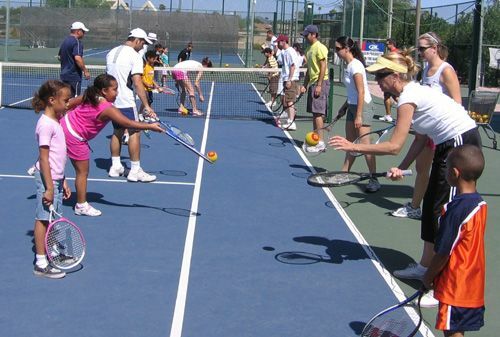 Approximately 45 people participated and many have already registered for the follow-up tennis lessons beginning Saturday, October 6 from noon to 1:00 p.m. Registration is now open for any Big and Little to take 4 weeks of tennis lessons in October at either Paseo Racquet Club (Glendale) or Kiwanis Tennis Center (Tempe). After taking the 4 lessons, players will earn a FREE new tennis racquet and can of balls, thanks to the USTA Central Arizona! For more information on the Your Turn for Tennis click here.